Devils vs Red Wings 11/17/18. 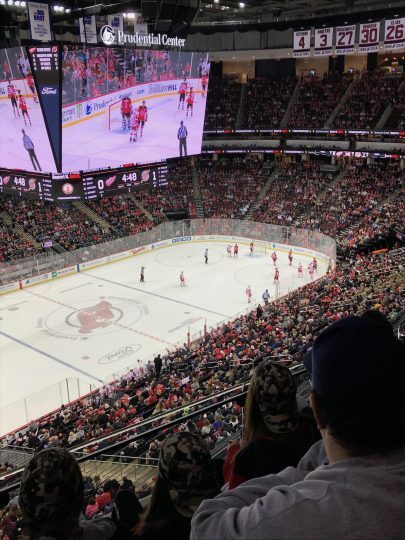 In November of 2018, I had the pleasure of attending a New Jersey Devils’ game at the Prudential Center in Newark, New Jersey. From Bloomsburg, it’s over a two-hour drive. The experience was unique and the arena was nice to see, especially if you’re a Devils fan like myself. The game day experience was unlike any other game I’ve ever been too. The fans were rowdy and ready to cheer on the Devils. 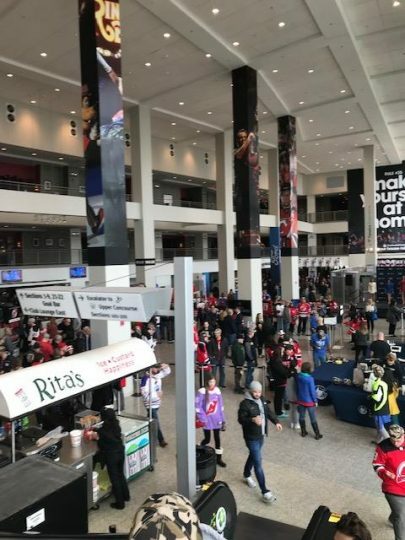 Main level of the Prudential center. The experience was one I will never forget. Except the outcome of the game, in which they lost 2-3 in OT. We sat in Section 109, where it had a bird’s eye view of the game. It also wasn’t too far from the bathroom. With so many concessions to choose from, the best options in my opinion, were the Goya and Villa pizza stand. There were a few good beer stands as well as some nice bar and grills located inside the arena. Looking for some Devils swag? Then check out the Devils’ Den on the main concourse. 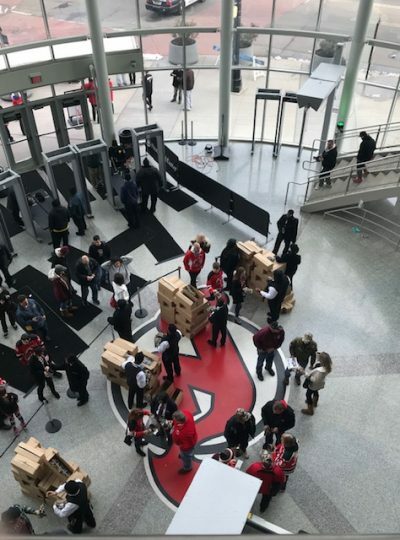 But if you’re sitting in the upper part of the arena, there are a few stands that sell Devils’ merchandise. So you can save a trip going down the escalator. If you’re planning on staying overnight, then I highly suggest staying at The Courtyard by Marriott right next to the arena. The hotel rooms were nice and the staff was super friendly. There is no pool, however there is a fitness center. You’ll have to pay for parking in the garage, and also pay for breakfast at the bistro in the lobby. Another option is Hotel Indigo, which is located next to the arena, too. 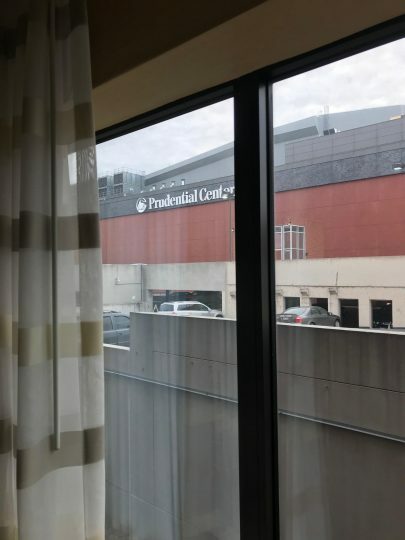 View of Prudential Center from Courtyard By Marriott. There are plenty of dining-in and take-out options around the arena. If you’re looking to just chill in your room after the game, then for take-out, I highly recommend Francesca’s Pizza & Pasta, located on McWhorter St, only three minutes from the arena. I suggest ordering any kind of pizza along with some of their salads. If you want to explore the dining-in options around the arena, then I would check out the Edison Ale House and Dinosaur Bar-B-Que, in the Championship Plaza on Mullberry St. But if you’re in a mood for German food and beer, then check out Redd’s Biergarten on Market St.
One of the main entrance’s at the Prudential center. If you’re a Devils’ fan, from New Jersey, or you’re just a visiting hockey fan, you have to check out the Prudential Center. The atmosphere is great and the crowd is amazing. The area around the arena had a lot to offer for not only for Devils’ fans, but hockey fans in general. So if you’re thinking about attending a game at the Prudential Center in Newark, go for it. Oh, and by the way. Go Devils!